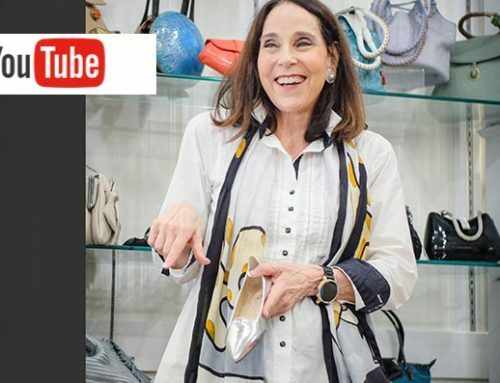 Marilyn Hellman, owner of Marilyn’s Distinctive European Fashion, located at 375 Fifth Avenue South in Naples, is well known for her YouTube videos on fashion tips, with over 550,000 views and 2,522 subscribers on her channel, Marilyn Hellman. By popular demand, Marilyn just completed taping segments for two new tutorial videos, “Hats and Face Shapes” and “The Best Scarf Video” with an added twist – she invited some of her clients to participate in the video sessions. On Monday, March 21, several clients were involved in taping short segments with Marilyn demonstrating how to choose a hat for their face shape and how to choose a scarf as an accessory to a fashion ensemble. The segments were added to the final cut of the new tutorial videos, “Hats and Faces Shapes” which was released on Tuesday, March 29 and the second video, “The Best Scarf Video” released in early May.